Tropical cyclone Josie didn't make landfall in Fiji but its heavy rainfall resulted in deadly flooding. NASA calculated the rainfall that Josie left in its wake as it moved south of Fiji and began weakening. Tropical cyclone Josie moved close to Fiji and its clockwise circulation streamed moisture over Fiji causing flooding that led to the deaths of at least four people. At NASA's Goddard Space Flight Center in Greenbelt, Maryland a rainfall accumulation analysis was created using Integrated Multi-satellitE Retrievals for GPM (IMERG) data. Those data are generated by NASA's Precipitation Processing System every half hour within about 6 hours from when data are acquired. IMERG data are acquired from the Global Precipitation Measurement mission (GPM) core satellite and those in the GPM Constellation of satellites. Those data are calibrated using the GPM core observatory's Microwave Imager (GMI) and Dual Frequency Precipitation Radar (DPR) as the standard. The IMERG analysis showed the locations of rainfall during the period from March 26 to April 2, 2018. During this period tropical cyclone Josie formed and passed by close to the southwest of Fiji and then to the southeast. IMERG data indicated that rainfall totals of greater than 250 mm (9.8 inches) occurred over large parts of Fiji. 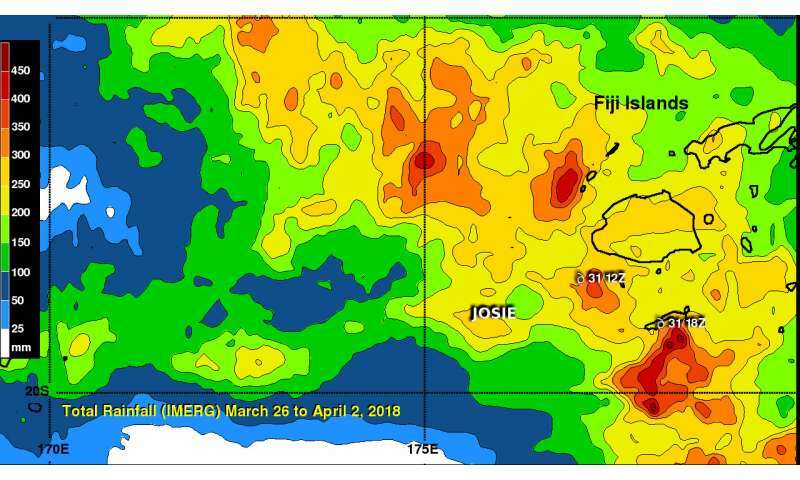 IMERG also indicated that tropical cyclone Josie produced extreme rainfall totals greater than 450 mm (17.7 inches) in some areas along the storm's track. The Joint Typhoon Warning Center (JTWC) issued their final bulletin on April 3 at 11 a.m. EDT (1500 UTC). At that time, maximum sustained winds were near 35 knots (40 mph/74 kph). Josie was centered near 23.2 degrees south latitude and 179.1 west longitude, approximately 304 nautical miles (350 miles/563 kilometers) south-southeast of Suva, Fiji. Josie has tracked southeastward at 16 knots (18 mph/30 kph). The JTWC noted that animated multi-spectral satellite imagery shows a ragged and fully exposed low-level center with flaring convection sheared to the eastern side of the center. Josie is being affected by high westerly vertical wind shear that is weakening the storm.